First, make the Maple Vanilla-Cardamom Sauce. It needs to chill before serving. Pour the cream into a heavy saucepan. Add the maple syrup, corn syrup and vanilla bean. Cook over moderate heat, stirring constantly, until the sauce is thickened and reduced by a third, about 20 minutes. 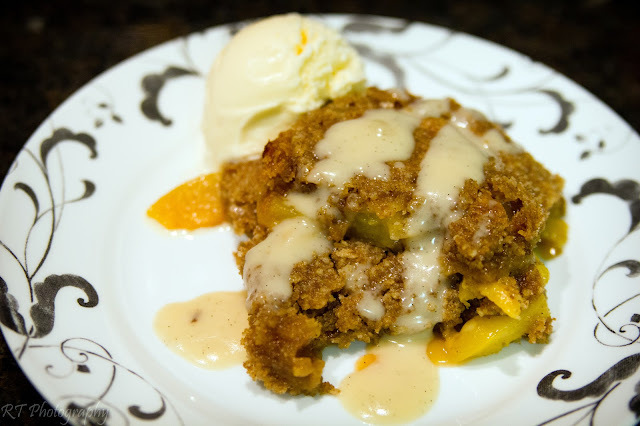 Chill for at least an hour before servings over the warm peach crisp. To prepare the peach crisp, preheat the oven to 350 degrees. Start with the crumb mixture. In a medium bowl, combine the flour, granulated sugar, brown sugar, cinnamon, nutmeg, and salt. Cut the cold butter into pieces. Add the butter to the bowl and use a fork or a pastry blender to cut it into the flour mixture. The mixture should resemble a moist, coarse meal. Place the peaches in a bowl. Add the lemon zest to the peaches. Mix in the lemon juice and maple syrup and gently stir the peaches to combine. Pour the peaches into a 9-inch square or 8x12-inch baking dish. Top with the crumb mixture, evening out the surface with a fork. Cover tightly with foil and bake for about 15 minutes. Remove the foil and bake for 30 minutes longer, or until the topping is crisp and golden brown. Spoon the warm crisp onto a plate, and drizzle the chilled maple sauce over the top. *The Pioneer Woman's helpful hint- Drink any remaining Maple [Vanilla-Cardamom] Sauce with a straw. Then fall into a deep sleep and wake up in a week, after your guilt subsides.